Plugging The Leak is not really fine tuning, but before we can fine tune — or indeed, before we can do anything more on The Aqueduct — we have to do it. We thought the problem was the drain that enters the small holding pond below the driveway. We dug up a section along the edge of the drive, removed some perforated plastic drain pipe and backfilled with heavy clay soil. It wasn’t a big job and it took only a few hours. But it didn’t work. We thought again. Could the cascade pond be leaking? 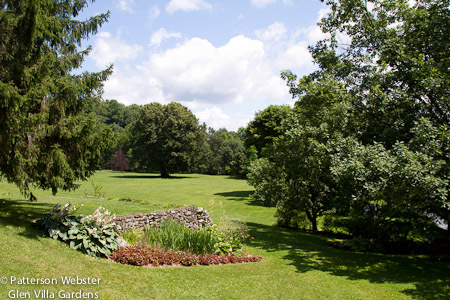 (The cascade pond is the one surrounded by spirea. I showed a photo of it in The Aqueduct, Part 2: Building It ) We built the pond almost 15 years ago and it has worked perfectly ever since. Still, we could see that water was pooling on the driveway near the pond so we decided to investigate. 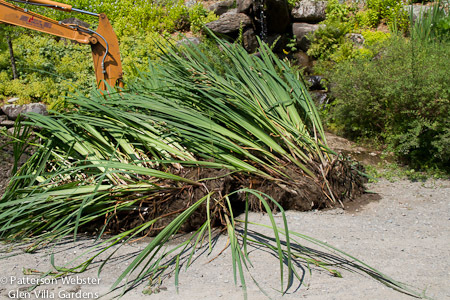 We drained the pond and dug out the big clump of iris pseudocarpus growing on the edge. 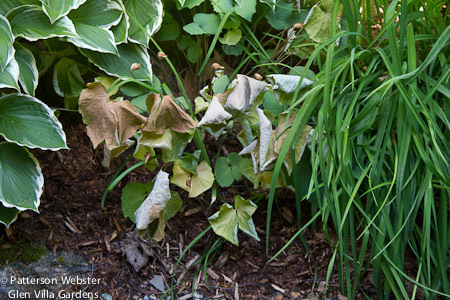 Removing them was easy: the roots were so tangled that the plants came out in a single scoop. 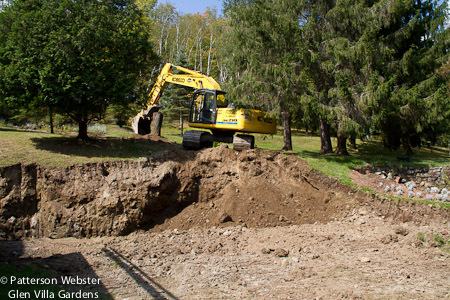 and put others in wet areas near the Skating Pond in the upper field. That is, if we can pry the clump into smaller pieces! 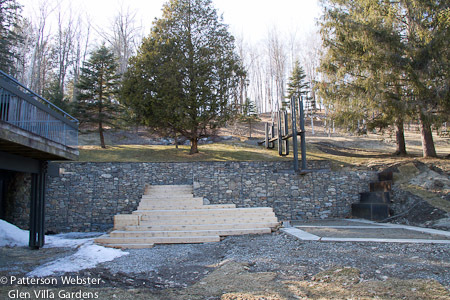 When we built the cascade pond, we put an enormous rock on one side, as a sort of viewing platform. Removing that big rock wasn’t easy but once some of the smaller rocks were out of the way, it didn’t take too long. And it is one BIG rock. Ken, standing next to it, is over 6 ft tall. That means the rock is about four feet tall. And heavy. 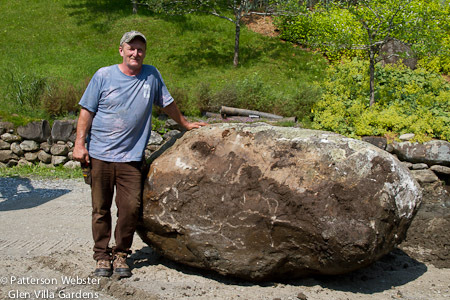 Moving the rock away from the pond was hard. Putting it back in place will be harder still. 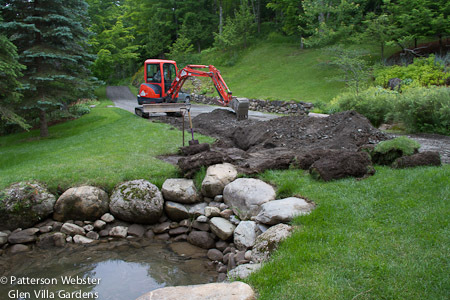 With the rock out of the way, we could dig down, remove all the rough rocks under the drive, until we came to clay. 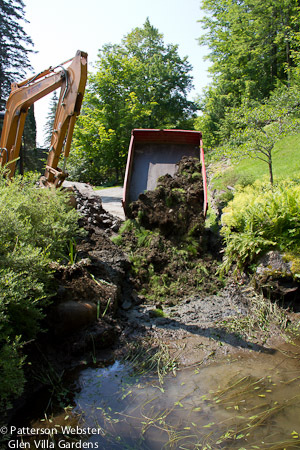 We dumped in a lot more clay to make sure water couldn’t seep out of the pond and into the drains under the driveway. into the drain under the driveway. Unfortunately, this didn’t correct the problem either. Resolving it is absolutely necessary. If we don’t, water will continue to run down the steps that lead to the front door. Not a good idea in summer, and potentially fatal in winter when frozen water would transform the steps into a ski slope. Plus the excess water is killing my special plant, Jeffersonia diphylla. Losing this plant would create a gap in my heart that would be very hard to fill. My one Jeffersonia diphylla is not looking happy. I’m not sure what we’ll do next. This is discouraging because instead of enjoying The Aqueduct all summer, it is becoming a headache. I won’t write about The Aqueduct again until we have solved the problem. 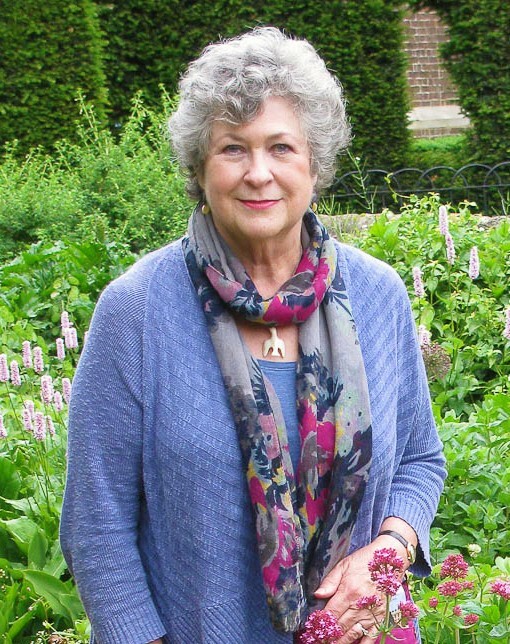 I hope you will join me next week when I’ll write about England and some of the magnificent gardens we visited there.